This was my spin on an Against All Grain recipe. It was not too difficult, and everyone liked it. It’s also “pretty”. Preheat the oven to 350 degrees. On a flat surface, pound the chicken to approximately 1/4 inch thickness. 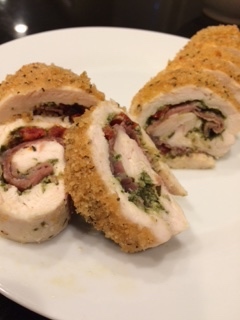 Smear a thin layer of pesto over each piece of chicken, add approximately 1 Tbsp sun dried tomato to each piece, but space them out. Add a layer of prosciutto over the top. Roll the chicken and secure with toothpicks. Sprinkle (or roll) chicken with the breadcrumbs. Bake for approximately 30 minutes. Using a thermometer is recommended. Remove the chicken once it reaches 155 degrees, and allow it to rest for 5-10 minutes. Slice and enjoy. Previous PostKeto BBQ Chicken Pizza!